Even though we live in neighboring cities - she's in Denver, I’m in Boulder, CO - I first met Trine recently at a residency at Brush Creek Arts in Saratoga WY. At that time she was working on a huge project of 129 paintings representing all of the National Monuments in the US that was to be shown at the Center of Visual Arts in Denver (it was indeed "monumental"). We’ll come back to that after we hear a little about her background. Hi Trine, thanks so much for sharing your experiences with us. First of all, where did you grow up? I believe your mother is from Denmark - did that give you a broader world view as a child? Yes my mother is from Denmark and my father was from Cincinnati. They met on a ferry in Denmark when my father was making his first documentary travel film, By Jeep Around the World. Certainly his job and her Danishness gave me a broader perspective on life; I was always intrigued by travel and curious about the world beyond Ohio. When did you first realize you wanted to be an artist? Did you go to school and were you an art major? And how has that fed into your art/travel life? I was an artist from before I can remember. I chose Rhode Island School of Design because it was the best school for me and they gave me a full scholarship. I loved Providence, RI - it was so different that Cincinnati where I grew up and had lived all my life. While there I did my junior year at the European Honors Program in Rome, Italy. I loved Rome and Europe but couldn’t afford to travel much, but I absorbed everything I could from living in Italy. "Middle Distance" 30" x 72" 2013 One of the paintings created from her residency at Denali National Park in Alaska. What are a few of the most impactful places you have traveled to, besides artist residencies, and how have they affected your artwork? Well, definitely Rome- all of the art history layered into one place- ancient Etruscan, Romanesque, Renaissance. There was so much to absorb. I traveled to Japan for my first job out of college, Arco Madrid and Art Basel in Switzerland. I did an extensive trip to Eastern Europe before the wall came down- East Germany, Hungary, Czechoslovakia, and Austria. I also spent a summer in Greece with my father while he made a film there. Also Spain, New Zealand, Honduras, Bosnia and Herzegovina, Ireland, Scotland, Wales and England, Iceland. and Denmark. Numerous trips back to Italy and Venice for the Biennale. They have all affected my work in some way, first by the art and architecture I see in them, then the landscape and people, finally in an abstract way how it enters into my own history and experiences. You have been a professional artist most of your adult life, while also raising 2 daughters with your husband. How did you manage to have such a prolific career, and even travel, while raising a family? And has your art career always paid the bills, or do you have other means of support? While I lived in New York, just out of college, I had many art related jobs to help pay the bills. New York was expensive. I found time to paint after work and on weekends. As I became more financially secure I quit working full time and started doing more part time and freelance jobs that gave me larger chunks of time to work in. Moving to Colorado after six years in New York allowed me to paint full time because expenses were much lower. I also started selling my work more consistently, first with Borgenicht Gallery in New York, then with Robischon Gallery in Denver. I took art teaching jobs but more out of the love of sharing art with other people than to pay the bills. I was a stay at home mother and my studio was at home so I was always able to find time to do my work when the kids were away or occupied or asleep! I paid for a minimal amount of babysitting in my home to ensure I could get some painting done each week. My husband is supportive but has a job with long hours and lots of trips. I was on my own most of the time so it wasn’t easy but somehow it all worked. What residencies have you been to so far - what were the pros and cons of each? Yaddo was the first residency and still stands out as one of the best- it came when I was pregnant with my second daughter and I was having trouble imagining how I would be able to be an artist with two young children at home. It was a very concentrated period of time where I did many large paintings for a show, and I feel it solidified my commitment to being a painter, no matter how challenging it got. I had a yearlong residency at the Rocky Mountain Women’s Institute that was studio and stipend only. It was a very supportive environment of all women and exhibitions and other opportunities to promote our work were present. Only downside was that the studios were small, but they were still great. I also did two residencies in national parks, Denali and Rocky Mountain. Pros were having the entire park to explore and be inspired by, and the solitude. Cons were that they were short (10-14 days) and the solitude! 1 of a series from "100 paintings for 100 Years" from her residency at Rocky Mountain National Park in Colorado. Oil on canvas 24" x 48"
Your residency in Alaska at Denali National Park sounded extraordinary. What strikes me is that you were mostly all alone in a remote vast wilderness, knowing there were grizzlies around etc. Yet you went for long walks making your sketches, etc., seemingly without fear! How did that come about - why did you choose that place, and how did it impact your work and future travels? Denali was phenomenal. I have never been in a place where people feel secondary to nature and wildlife. It was immense. I have hiked a lot- I don’t have fear, but I am cautious, I am very, very aware of my surroundings and do all the things you’re supposed to do and not do in the wilderness. For me the curiosity of seeing what lies ahead in a remote area is greater than the fear. You had a big show called “100 paintings for 100 years”. Please share the theme and where you did the work etc., and eventually showed it. I did that show after my residency at Rocky Mountain National Park. It was the centenary of the park and I wanted to do something that acknowledged that time span. I wanted to make a big statement about a big place and a great number of years, and to create the sense of complete immersion I felt when in the park. Each painting was a detail of the natural landscape- branches, rocks, water, clouds that would together express a sort of journey. It was shown at the Denver owned McNichols Building, which was a neoclassical building of the same area that the park was founded. I was able to use the entire top floor and exhibited all of the paintings around the perimeter of the space. You have had some exhibitions of your work in very exotic international countries such as Bosnia and coming up, the DMZ zone in Korea. Tell us how you came about doing those shows and are they related to those specific places? I am part of an art collective called the Artnauts and we do shows in areas of the world where there is social injustice. In Bosnia I was also invited to present a solo installation called Prayer Flags for Peace related to the war years there. 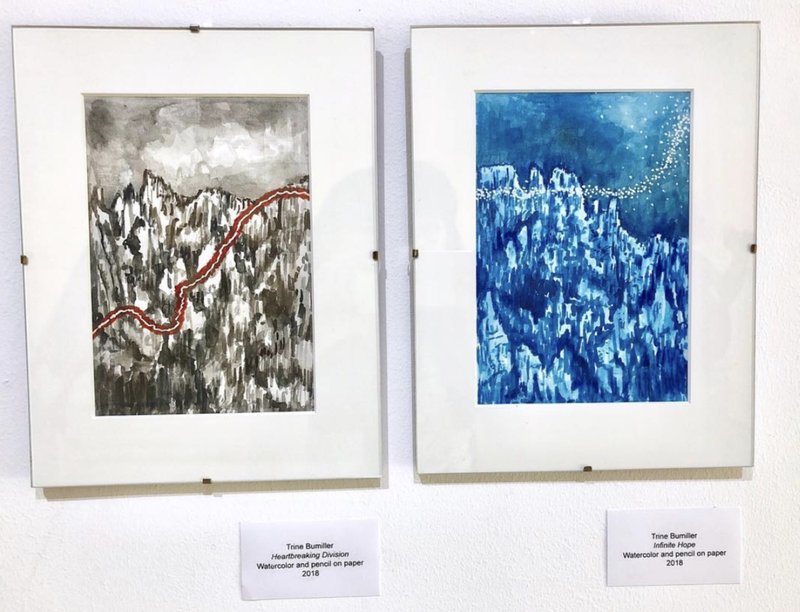 In the DMZ Museum of Korea I am showing two pieces related to the border and the Diamond Mountains just across the border to the north, an area that is revered in the Korean culture. Can you talk a bit about your recent project for the CVA mentioned before with the theme of the National Monuments? How did that come up and how did you decide on the presentation? 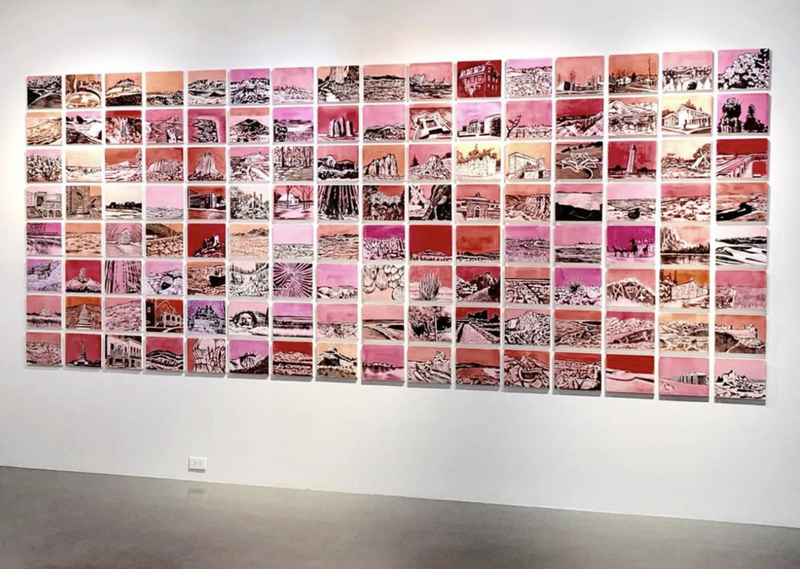 Monumental was created for a show called Pink Progression that commemorated the Women’s Marches in 2016 and 2017. I thought about how the need to honor and respect women was similar to the need to honor and respect special places and memorials. I painted 129 national monuments, each with a different pink background to highlight that significance. They work well as a large grid; altogether it is about 8 feet high by 16 feet wide. I wanted it to be monumental. What would you say are the biggest highs and lows of traveling as an artist, whether to an artist residency or otherwise, and can you give us an example of each? The biggest highs of traveling as an artist is that art is a universal topic. When you tell people you’re an artist, everyone has a connection to that and it can spark conversations and the exchange of ideas, or at least help you make friends. I also appreciate that wherever I go there is usually art to experience in museums, galleries and as architecture- it’s a way to find your way through a new place and to revisit again and again. Lows are that it can be expensive to travel and it’s not always possible to go or stay in the most exotic places. 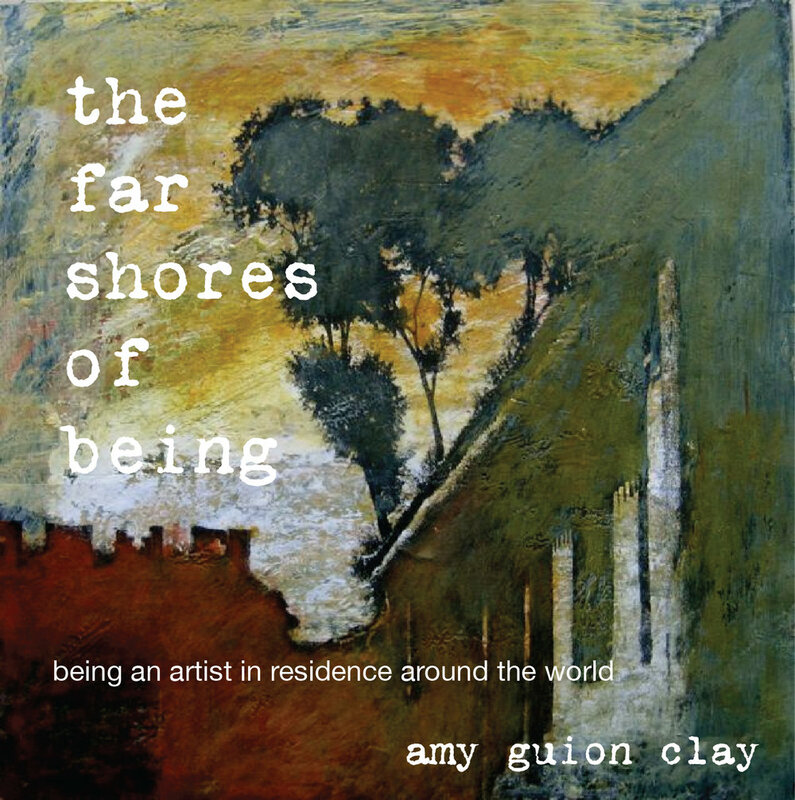 With residencies I love the complete experience of a simple life of eating, sleeping and making art and hiking. I like being disconnected from my normal routine and focusing all my attention on my work, and also meeting other residents from other parts of the world. The downside is that there is a lot of preparation and catching up to do before and after. And with a family it’s hard to leave children and husband. What advice would you give anyone wanting to apply to artist residencies, or even if they just want to make art while on the road? Apply to the ones that intrigue you. Be realistic about the amount of time you can spend away and the costs of getting you and your supplies to the residency. Check with friends that have attended and former residents if you are not sure it is a worthwhile use of your time. Go with enough supplies to last. Have an idea of what you want to do but be flexible enough to change your mind. Keep your eyes open for new inspiration, from your surroundings or the other residents, don’t just do what you usually do. Don’t waste a moment- you are there for a limited time, absorbing everything you can from your location and the gift of a place and time to make art. But take a nap or a day off if you have to. Get to know the other residents, be open to their ideas, check out the surrounding community; you can learn a lot. Thanks so much to Trine for sharing her extensive and fascinating art/travel experiences with us! You can visit her site: www.trinebumiller.com and follow her on Facebook and Instagram. 30 Days of Aqua - a painting challenge.